Have data, must make pie charts. It's been a long couple days and my brain is teetering between blank and foggy. It's times like these when I enjoy some good mindless data analysis. It's fun to look at numbers and speculate about the story they might tell. Today is day four of Read an Ebook Week, which, I'm convinced, is like Christmas for book lovers. Our traffic the last few days almost doubled over the same period a week earlier. Thousands of ebook readers around the globe wore their mice ragged during a gluttonous ebook binge to download our 3,000+ participating titles offered at deep discounts. The traffic Tuesday reached such fervor it caused the site to crash and stay crashed nearly all day. It was a horrible, gut-wrenching experience to preside over our comatose baby. Thankfully, after we performed some radical database surgery, the site jumped back to life, faster than ever. Back to data. As of this moment, 2,341 Smashwords books with a price are participating in Read an Ebook Week. Probably another 1,600 (don't quote me on that) are also participating because they're already priced at FREE or "Reader Sets the Price." 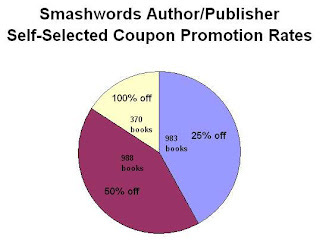 We gave authors and publishers the opportunity to manually opt-in their books to one of three promotional discount levels of 25%-off, 50%-off, and 100%-off (FREE). The only requirement was that the book needed to carry a pre-coupon price, and the price after application of the coupon needed to be either free, or $.99 or higher. So I bet you're wondering, which coupon levels did they choose? The fascinating answer is in the pie chart above and the list below. Books given the 50% coupon had an average pre-coupon price 13% above the 25% coupon books, yet after applying the discounts, the 50% books cost $2.60 while the 25%-off books cost $3.45. In other words, the more expensive books were selling for 25% less than the less expensive ones. Got that? The 50%-off coupon books sold at a rate nearly four times higher than the 25% books. Perhaps the combination of perceived value (of higher price, greater discount) with lower price made all the difference? I'm interested in the average sales figures for the 'free' ebooks on promotion. My own three titles have a sales combined total of 102 for the week to date. I'd like to see where that comes in the rankings as I've done a lot of marketing for the 'Read an eBook Week' campaign. Best of luck for remainder of week and well done to your IT guys for keeping the show on the road despite the avalanche of downloads. I have been keeping my own stats, and I found your stats interesting and very useful, Mark. I've had an amazing week, with two of my titles sitting as #1 and #2 on top of the specials list for young adult best sellers. One of them, "SONS and BROTHERS in SEATTLE" normally lists for $2.99 and I made it free for this week. I most certainly have seen increased sales. I've also noticed some crossover to my regularly free titles, with a definite surge of download numbers. All in all, a good week, and with 48 hours yet to go, there's still room for more good news yet. Even with the glitch that took the site down for a while, I've been very happy this week. Thanks for the news, Mark, and the tools for the good week. Des, your performance as of that date was above average, so good job! Wilson, great to hear about the crossover.